As a resident of Florida, I wear sandals almost year-round. You know what that means—dry feet, rough heels, and trying an array of lotions and creams. 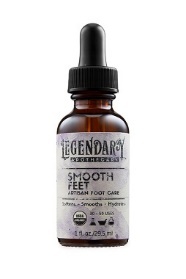 However, I recently received a sample of Legendary Apothecary Smooth Feet and was blown away by how wonderful it made my feet feel. I saw a difference from the first time I used it. Not only does it feel wonderful while you’re massaging it into your feet, it provides some heavenly aromatherapy. You use it two to three times a week, though you may want to use it daily just because it’s such a nice product. It smells heavenly because it’s made with simple ingredients that include vegetable, glycerin, pure lavender oil, and grain alcohol, which oddly enough, does not dry out the skin. The only thing that makes it feel better is if you can get someone who loves you to do the massaging. These completely organic ingredients are soaked up by your skin to soften, smooth, and hydrate. It’s an Old World recipe passed down from co-creator Sara Saidy’s grandmother Masy. It just takes a few drops and each bottle provides 30-50 uses. Learn all about this wonderful, natural product at legendaryapothecary.com and get the full story on Masy.